- Angle of gun elevation increased to 35degrees. Two vessels to be laid down as replacements for Conte di Cavour and Andrea Doria. 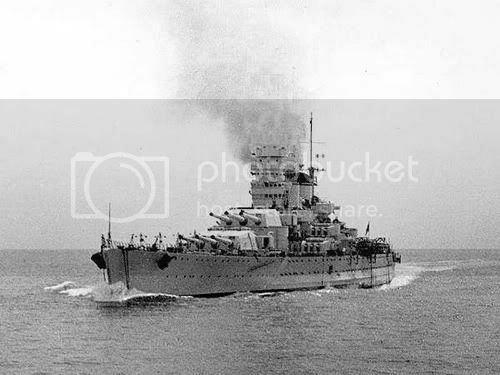 Provisional names are Littorio and Vittorio Veneto. 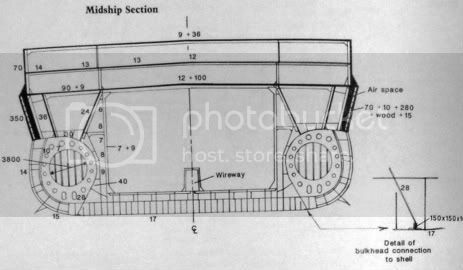 It is likely that a further two ships will be laid down over the next 5 years, probably to a slightly modified design. The design builds on the cancelled VEIII class from 1928. The overall layout is similar but there are subtle design differences. Hull: Slightly beamier for a wider TDS. No quarterdeck aft and generally higher freeboard to give better seakeeping. Machinery: Same with 160,000shp on 4 shafts. Improvements to the hull form have allowed the maximum speed to be increased to around 31knts. Less bunkerage as the range of the previous ship was thought to be excessive. Triple rudders used instead of the old single rudder. Main Armament: Similar main armament with 9x381/50 guns in 3 triple turrets fore and aft. Secondary Armament: New Dual-Purpose 152mm/53 guns fitted in twin mountings on the beam. They are thought to be generally superior for AA and ASuW use to the 135/45 triples. AA armament: Increased since 1928 with newer 47mm guns and more of them. Will probably be fitted with some 20mm FFL guns in service in unpowered mountings. Deck Armour: A 36mm plate runs over the weather deck with the main armoured deck two below. It is 135mm thick over the machinery and 155mm over the magazines. The steering gear has a 100mm thick armoured box. Other armour: The main turrets have 380mm faces, 200mm roofs and 350mm rears. They are mounted on 350mm thick barbettes. Conning tower armour is just 70mm splinter plate so as not to detonate large calibre rounds. Other notes: Quarterdeck is strengthened allowing for vertiplane landings. Lengthened Littorio Class to accommodate four triple turrets.